A dad-of-two had his stomach removed after discovering he was the carrier of a rare, hereditary gene which made him more susceptible to stomach cancer. Two of Dan Taylor’s cousins had sadly died following their diagnosis, and multiple family members have previously tested positive for the gene. In 2011, Dan, 28, also tested positive, receiving the devastating results while his wife was seven months pregnant with their second daughter. An endoscopy and biopsies conducted during the same year revealed he was clear of cancer. However – knowing full well how such tests could prove unreliable – Dan made the difficult decision to have his stomach removed as a precaution. Speaking with UNILAD, Dan explained his decision to have the surgery was a ‘numbers game’, with 80 per cent of those with the same condition getting an aggressive strain of stomach cancer. At the time my daughter Abigail was three, and my wife was pregnant with our second daughter – I couldn’t bear the thought of not seeing them grow up, or leaving Anne to take care of them on her own. So for me it was worth whatever problems I would have afterwards to be there for them. It’s hard to tell people whether it’s right or wrong to do what I did, for me it was the right decision, but my Dad who has the same genetic condition as me is 94 and was one of the lucky ones never to develop cancer. The one thing I would say is that the recovery and long term implications weren’t nearly as bad as I thought they might be, but you need to positive and strong willed to get the best out of life. Dan underwent a grueling five-and-a-half-hours of surgery in June 2012. ‘Basically, my whole stomach was removed, and in simple terms the bottom of my oesophagus was attached to the top of my intestine,’ he explained. It turns out Dan had made absolutely the right decision by undergoing this precautionary surgery. After his removed stomach was examined, it was found he had the first stages of stomach cancer. Thankfully, it had not spread to other parts of his body. Super dad Dan was back at work within a matter of weeks, and was also intent on keeping up with his lifelong passion for running. 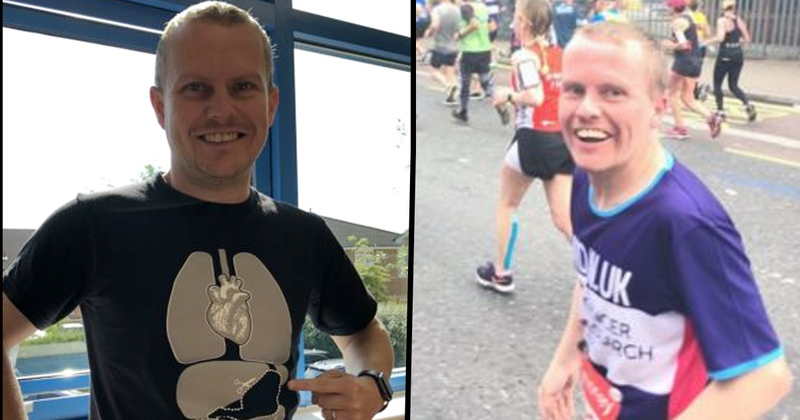 A keen runner since his teens, Dan had to take a break from running before and after his op. However – demonstrating phenomenal determination – he has since managed to get himself back into fighting shape. 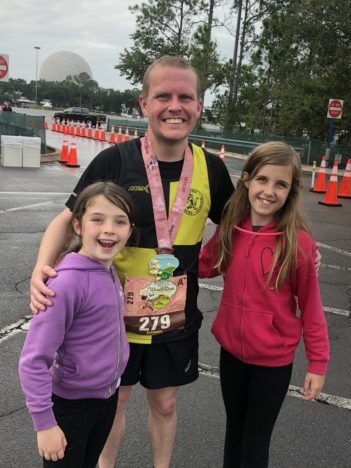 I took a break from running in the months before my surgery to spend time with our girls, doing fun things so after the surgery I was on the back foot a little bit as it was almost a year that I stopped for in total. I started back with some short runs around 2-3 months after getting out of hospital and slowly built myself back up to the shape I was in before. What I found though ultimately was that my slightly leaner body was quite well suited to running, and within a year of starting running again I was in better shape than I’d ever been before hand. The thing that is difficult to manage is dehydration and weight loss. At the best of times it’s difficult to maintain the right weight, and when you start throwing in needing to take on an extra 2,000 calories some days that’s a challenge. Fluids can be tricky too trying to get enough in, and then trying to keep it in when you’re running because I don’t have the little valve that stops stuff coming back up again. You get used to managing it though. 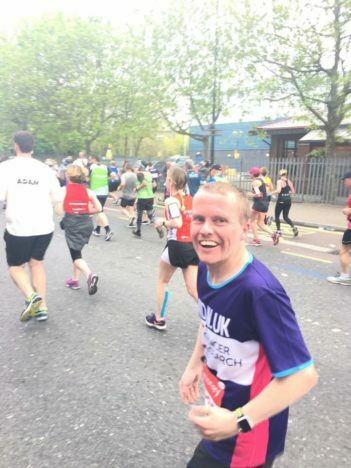 Following his surgery, there has been no stopping Dan, who has already completed several long-distance sporting events. In June, Dan will tackle the formidable Race to the King, a 53 mile run along the South Downs Way, which stretches from Arundel to Winchester. He hopes to complete this run in approximately 12 hours, all while raising money for York Mind. This 100km ultra marathon is a test of endurance for any accomplished runner, and the fact that Dan is dealing with health issues while preparing for this feat is truly commendable. I’m generally a positive and motivated person – it can be hard though, especially in the winter to drag yourself out and do it. I always tell myself as much as I don’t feel like doing it sometimes once I get started it feels great and once you finish you can feel proud that you’ve done it, whatever the distance is. It’s nice to set yourself a goal and a reward, my favourite is a long(ish) Sunday morning run, followed by a roast dinner and a pint! All the very best of luck to Dan, whose bravery, tenacity and positivity knows no limits. A true inspiration for adventurous runners everywhere.